I well remember the occasion - it was a scintillating sermon and those of us "on the same wavelength" as Joseph recalls, got to know him as a result. This was during Trinity Term, the term after I had served as President of the Oxford University Newman Society, which I had the great pleasure of addressing earlier this year. What I am saying is that we are in a battle situation, and that the wholesale dismantling of the Catholic tradition is pastorally disastrous. In a commonplace book which I used to keep in those days, I have just dug out an entry that I made. 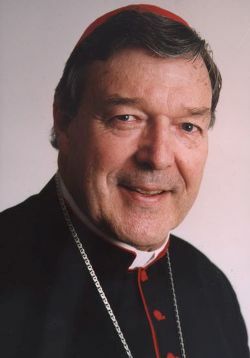 Referring to "The increased number of avowed atheists, the decline in Church going, baptisms and marriages in Church, the fall in vocaitons, the departure of so many priests and religious, the increase in violent crime, the permissiveness of hte media, popular abortion, chanigng marriage and divorce patterns"; and contrary to "one Anglican bishop" who thought that "through this the Church was becoming lean and fit", Fr Pell proposed that "A massive haemorrhage is occurring and we must stop saying this is a good thing, just as we stopped believing long ago that blood letting is always therapeutic." I can't remember whether this entry was written with the text in hand or from memory of the sermon. Best bit of "Into Great Silence"
Can we see it now? New Liturgical Journal: "Usus Antiquior"
"Sons of the Most Holy Redeemer"
Conference: "The Faith, The Family... The Future"
Alcuin Reid reviews "Worship as a Revelation"
Come on in.... it's awful!